Ramco recently partnered with Edison State Community College for team leader training. 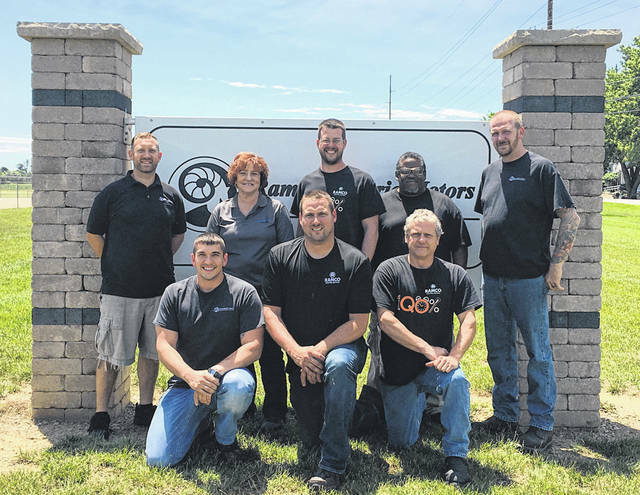 Pictured (front row, l-r) are Steve Wike, Jason Hemmerich, Troy Stewart, (back row, l-r) Bryan Tippett, Peggy Wiggins of Edison, Jason Netzley, Damon Miller and Keith Bragg. GREENVILLE — A Greenville company is teaming with Edison State Community College to grow its team leaders. Ramco teamed up with Edison to develop a special tailored program to not just data dump information on its leaders but to help plant the seeds to those skills and continue to water them in different approaches over nine weeks. The team leader training for Ramco went further. First, Ramco surveyed the employees who would be going through the training to identify their skill level in various leadership areas and how they perceived the importance of each of those areas. From those surveys Ramco could select specific courses that would address the issues identified. Then the trainer came to their facility and a get-to-know-you session was conducted with all the trainees and the two production managers present. Following that session, the trainer went out on the production floor and met with each team leader individually, observing how they interacted with their teams and probing further to get to know them even better. The biggest gain for the team leaders came from the opportunity to meet away from the facility and talk about their successes and what they needed to improve, all while building their skills as leaders. They began to seek each other’s input when they faced challenges, rather than just dealing with them on their own. This helped them not only grow as leaders but also to begin to develop leaders from their own teams. For Edison State, the changes that Ramco made of evaluating each team leader before, during and after the program enabled the trainer to understand each team leader more fully and be a better coach throughout the process. The team leaders participated more fully in each session, making the classes more effective. The experience was personally very rewarding to the trainer, to get to know each team leader personally and watch them learn, change and grow. This entry was tagged College, community, Edison, Greenville, leaders, Ramco, team, training. Bookmark the permalink.